ATHLETICS/KENYA: From 800 metres to the marathon, 2011 marked another extraordinary year in the Kenyan dominance of distance running. IAN O’RIORDAN spent three weeks living and training among them in Iten, the home of champions, to discover if their secret is in the high altitude or simply their relentless running regime. The same dusty roads that helped turn Abebe Bikila from Emperor’s bodyguard into Africa’s first Olympic champion. The 2011 Great Ethiopian Run, and first test run at a properly high altitude. With 36,000 others singing, chanting, dancing for 10km, running fast the least of their priorities, there is little chance of being breathless here, only in the metaphysical sense. Musnet Geremew, one of the local elites, wins it in 28:37. Yet outside of Ethiopia even this great tradition is bowing to the all-conquering dominance of the country directly south, the now undisputed kings of distance running – and the only way of fully understanding how the rest of the world will ever beat them is to join them. So it’s onwards, and upwards, to Kenya. When you’re running at 8,000 feet on what seems like the edge of the world and the sunrise splits the landscape into a kaleidoscope of bottle-green fields and dark tangerine tracks it’s not just the sound of your own breathlessness that catches you first. “Howa’you?” It’s the sound of children running from the bushes and mud huts, aged maybe four or five, laughing. “Mzungu! Howa’you?” One of them begins running alongside me, and he’s not breathing at all. In the few short minutes since starting out I’m desperate to stop, as if gravity has let me down, every ounce of air sucked out of me – a taste, perhaps, of what it’s like to climb Mount Everest without oxygen. The Mzungu – the Swahili term for “white person” – is still a novelty for the children, although for the older residents we’re a familiar sight. 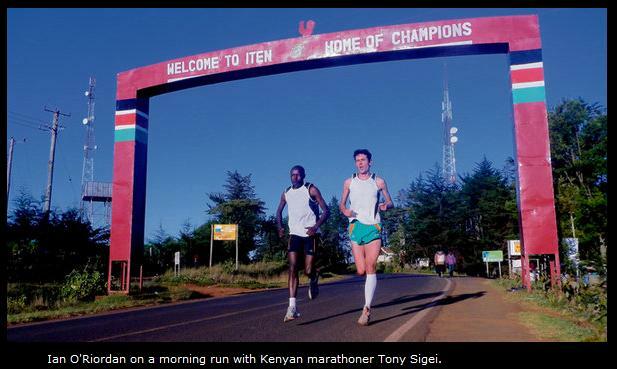 Iten has rapidly become a sort of Mecca for elite distance runners from around the world, who come looking for answers: why are the Kenyans repeatedly raising the standards and, it seems, the limits of human endurance; why this place is the most concentrated pocket of athletic talent on planet earth. The answer may be in every breath you take, at least for the average Mzungo; each small hill chokes your engine, any injection of pace brings breakdown. Iten remains a small farming village, perched at 7,875ft on the western escarpment of the Great Rift Valley, where there is no such thing as a flat road or path: most of these frequently rise above 8,000ft. I’ve camped in relative comfort at the High Altitude Training Centre, set up by Lornah Kiplagat in 1999, although that still means total immersion in the Kenyan running routine, starting with the 6am run. This first one is proving much harder than anticipated – as if I hadn’t run in months, when actually I’d trained quite hard for the training camp. Once off the rutted track out of the camp and onto the smoother mud path that runs into the village, I pass under a large steel arch that reads “Welcome to Iten – Home of Champions”. No one keeps track anymore of how many Olympic or World champions were born, raised or else moved here to train, and when big city marathon winners are included, it must be several hundred. I run at my own pace, deliberately so, knowing any attempt to run with the Kenyans on day one would finish me off. After about an hour I arrive back at the camp, never once breaking past snail’s pace, and it felt like one of the hardest runs of my life. Two more weeks of this and there won’t be any secrets anymore. Misty and unseasonably cool. The plan changes and I skip the 6am run to help the acclimatisation and go at 10am instead, easy and slow, taking in a viewing of the only running track in town. It’s only a mile or so from the camp, perched on the very edge of the escarpment, far enough for my lungs to demand a rest. A sign on the old rusty gate: “Kamarin Stadium” – although it’s more shack than stadium, with rows of broken down outhouses on the backstretch, and a near crumbling wooden stand on the home stretch. It looks like a relic from the 1950s. Kamarin was built as a showgrounds for local farmers to parade livestock. “How much left?” I ask. After two minutes I’m in trouble, let them finish on their own, while wondering out loud if I was ever going to hack this altitude. He introduces himself as Washington. He’s eager to share his story; how he’d finished school about a year ago, and without any funding for further education, came to Iten from nearby Eldoret to train, full-time, sharing a two-roomed house with his three friends. He just tells me he runs three times every day, same as every other Kenyan here: at 6am, 10am, and 4pm. He lives to run, run to lives. “I believe I will succeed,” he says, and it’s that confidence, combined with a determination and desperation, that made me believe in him too, made me realise in Kenya it’s not just the training system but the training psyche that may ultimately set them apart. Runners like Washington survive with zero funding, although some of them are more fortunate, those that represent the army, the police, the prisons service, and are fed and housed in basic training camps like one set up behind Kamarin. “Maybe I’ll see you for a run tomorrow,” says Washington, and when I ask him what time he smiles. The Mzungus, they say, have the watches; the Kenyans have the time. On the fourth day of training at 8,000 feet the body pauses for repair – whether you like it or not. Some Mzungus adjust better than others, but I’ve been waking up repeatedly during the night, developed a chesty cough and runny noise, felt pins and needles in my feet and hands throughout the day, got sharp and sudden headaches, along with badly chaffed lips and dry skin, and a frequent urge to urinate. Most of these, I’m told, are minor symptoms of altitude sickness, part of the process of adapting to training in lofty places such as Iten. It’s a well-worn theory, that the lower oxygen levels in the thin air forces the body to adapt by increasing the red blood cell count, the ally of every endurance athlete. Then, on return to sea level, comes the distinct advantage over those who only ever breathe the more fully oxygenated air: you run like the children in Iten. Although Kenyan training is not just about breathing it – and preferably for at least three weeks, or the amount of time it takes for the high altitude to work on our red blood cells – but also about living it and eating it. 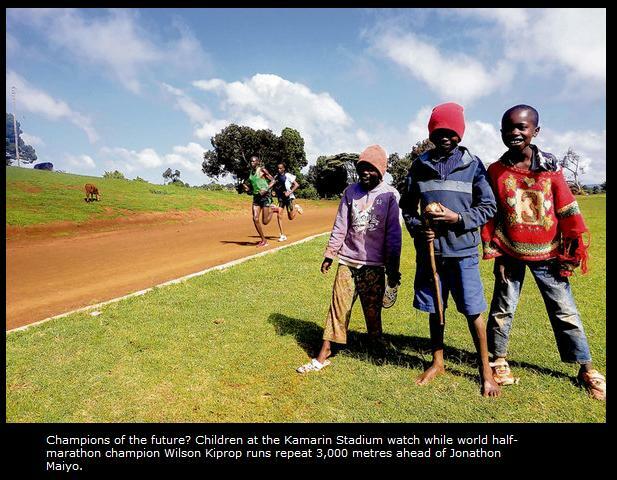 That’s why among the others camped at the High Altitude Training Centre are several British distance runners, including Paula Radcliffe, who even at this late stage of her career has come to Iten to seek that extra edge. Mo Farah will check in for January, and still credits his first extended stay in Kenya, two years ago, as the single most important reason for him going from world contender to World Champion. We all eat our three meals a day at the camp – freshly prepared from fruits and vegetables grown in the fields next to us – and share ideas too. There are also Americans, Canadians, Dutch, Swedish, and South Africans, all here for their share of the thin air. Even the Russians are coming. But you can’t rush it, or force it, so I take the rest of the day off and walk to the nearby Kerio View Hotel, the only proper hotel in the village, order a strong, black coffee while overlooking the Rift, knowing sitting there breathing in the thinnest of our earthly air counts as a training session. As in David Lekuta Rudisha, world champion and world record holder over 800 metres, aged just 22, and just the latest in the long line of great Kenyan runners discovered and coached by Brother Colm O’Connell. 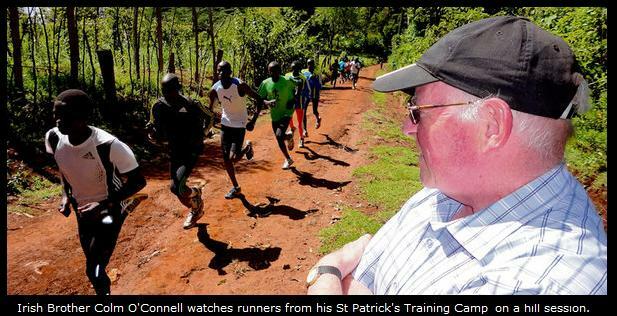 Brother Colm’s story has been told many times: how he left Cork in 1976 and came to Iten as a missionary teacher, soon found himself appointed athletics coach at St Patrick’s, and gradually helped convert the nation into one famous for its distance runners. Although he retired from St Patrick’s, as headmaster, in 1993, he maintains close ties with the school, still lives in a small house on campus, and at age 61 still writes fresh chapters in the history of Kenyan athletics. I’ve timed my visit well: school is out for the “summer” term, and instead Brother Colm hosts his St Patrick’s Training Camp, which he’s been staging since 1989, when it was the first of its kind in Kenya. He’s kept it modestly sized, but with growing ambitions: he invites 20 boys and 20 girls from around the North Great Rift region, aged between 14 and 19, each with that unmistakable leanness of the Kenyan runner, and sets many of them on their way to being champions. At the forest they begin their hills, about 150 metres, repeated 20 times: they start at their own pace, and Brother Colm never pushes them. Yet they wind it up, naturally, until appearing to run the last few flat out, small beads of sweat on their foreheads. I ask him what it is he looks for in a young Kenyan runner, knowing the vast majority come from the Kalenjin tribe, even though they make up only 10 per cent of the population. But Brother Colm doesn’t like to limit himself like that; he’s also invited a few Maasai, less famous for its runners, yet which produced David Rudisha. Back at the St Patrick’s dining hall, the runners are served plates of rice and beans, after which they’ll rest before another easy run at 4pm. Brother Colm tells me that of these 40 athletes, he reckons 10 will go on to represent Kenya, and probably win championship medals at some level. Inspired by the young runners at St Patrick’s the day before, I resume the 6am run, and for the first time don’t think twice about the 8,000ft. Instead I take note of the passing runners. Some float by in pairs, others in groups of 20 or more. They’re nearly all dressed in heavy nylon running jackets and faded running tights, but the few who do wear shorts display stick-thin legs, and instead of calf muscles, mere bones that appear tightly bound with thin black leather straps. It helps that I’m accompanied by Tony Sigei, local marathon runner, who has clearly taken pity and adopted me as his young pupil of altitude training. I follow Tony and a small group back to the camp, and into the gym – and the only properly-equipped weights room in Iten. Wednesday typically includes a gym session for the Kenyans, and first up they drop to the ground for sets of push-ups. So the Kenyans do lift weights – only not the savage bench presses, but savage repeats of the lighter, free weights, again with no one keeping time. It’s a further demonstration of their immense dedication: running is obviously a career and life-changing opportunity, and the Kenyans apply themselves that way. It’s as if their lives depend on it, because in many cases their very livelihood does. It’s almost 10am and I don’t think any of them have eaten yet, but half-starved, I head back over to the diningroom for ugali – a maize porridge. Kenyan runners eat it twice daily, and can’t go more than two days without it: to me it still tastes like wallpaper paste. Nowhere is the Kenyan dominance of distance running more complete than in the marathon: they clocked the top 24 fastest times in 2011, won every major city marathon, almost all in course records, and had Patrick Makau lower the men’s world record to 2:03.38, in Berlin. That’s only a taste of it. I’m told one man who can explain this is 67-year-old Renato Canova, the former Italian distance running coach, who now resides in Iten – mainly because it’s the only place left in the world where he can find athletes with the work ethic to handle his training philosophy. I meet him at the stadium, where he’s putting Wilson Kiprop, the 2010 world half marathon champion, and training partner Jonathon Maiyo through a session of 6 x 3,000m, averaging 8:50, with three minutes recovery between sets. Canova wrote a book on marathon training in 1999, yet since coming to Kenya eight years ago has effectively rewritten it. “Yes, 50 per cent of that is different now,” he says. It helps he has a stable of about 50 athletes to experiment with – about 35 Kenyans, and the rest Ethiopians, or Kenyans running for Qatar – and he’s not afraid to continually press their limits of endurance. In recent months alone Canova coached Moses Mosop to a course record in Chicago (2:05:37) and Florence Kiplagat to a victory and personal best in Berlin (2:19:44). For as long as possible I’d been putting off my run with Lornah Kiplagat. She was only getting back to full training after qualifying for the London Olympics in the marathon, and when she suggested a two-hour run, at 7.30am, it all seemed reasonably well-timed. Then I remembered Lornah is better known as Simba – the “lion”, for her fierce application to training and racing. She may be 37 but she’s lost little of that reputation, her long career exceptional even by Kenyan standards. These days she runs for the Netherlands, having married former Dutch triathlete and athletics agent Pieter Langerhorst, yet they still consider Iten as home, where together they’ve developed the High Altitude Training Centre as the perfect gateway into Kenyan running. I needn’t have worried: as Lornah leads me on her two-hour loop out she inspires with tales of her youth and experience, our running rhythm suddenly in sync with each other and the rolling landscape. Like so many Kenyans it began by running to school, four miles there and back, in the village of Kabiemit, about 20 miles down the Great Rift. It’s reckoned young Kenyans have 18,000 runs before their European or US counterpart begin regular running. Quite a headstart. She never ran junior for Kenya, and instead took early to road running: she was entered into the 1997 LA Marathon, believing it was only a half marathon, but won, and later added three world road titles, plus her most cherished win of all – the 2007 World Cross Country, staged in Mombasa, Kenya’s first and only hosting of the event. An Olympic medal is the only honour that’s eluded her, which is why she’s still running for two hours every day. Perhaps it’s because I’m running alongside someone as smooth as her or perhaps it’s because I’m at last acclimatising but it feels almost effortless to me too. The only break in Kenya’s relentless training schedule is Sunday where, after a light morning run, they do nothing else for the rest of the day. I take the day off too and hop into a matatu – the rickety and cheap taxi – for the 20-mile drive down to Eldoret, a journey that seems to move forward in time. “Make it around 1pm,” said Ian Chaney, who had sourced the only reliable feed of the European Cross Country Championships in all of East Africa. Ian had a vested interest: since first coming to Kenya eight years ago he’s been establishing himself in the agency business, and one of his most trusted athletes is Fionnuala Britton. I find Ian sitting nervously in his armchair. Brother Colm also makes the trip and is the first to calm our nerves. “Terrific rhythm,” he says, “and a lovely smooth tempo. I think the surface is suiting her. She’s looking very good.” Turns out Britton had also spent some time in Iten, in the spring of last year, at which point Brother Colm had predicted her potential to win a European Cross Country. Once again he proves his natural tendency to get these things right. Thursday is Fartlek day in Iten, usually at 9.30am, and usually drawing every decent runner from across the village. After two weeks of running at 8,000 feet it’s time for the ultimate test run, to feel the true tempo and spirit of the Kenyan runner. Over 100 show up, none of them wearing a heart-rate monitor. Most don’t even wear stopwatches. It’s running at its most basic. After a 20-minute shuffle one of them takes off, and in the stampede that follows, I’m quickly left in their dust. With that comes the realisation the Kenyans will always run at a different pace to the rest of the world. They’re motivated to maximise their potential not by fame but by fortune. The reality is that for every one of them that makes it, maybe a hundred won’t, but in that moment, among the large group of runners that have disappeared around the corner ahead of me, every single one of them believes they will make it. That may be their only secret after all. Epilogue. 982 feet. The Mzungu is back on familiar soil. A few minutes after leaving the house every breath feels laced with oxygen. My best years may be behind me, but I can’t recall running ever feeling this easy, or so free.